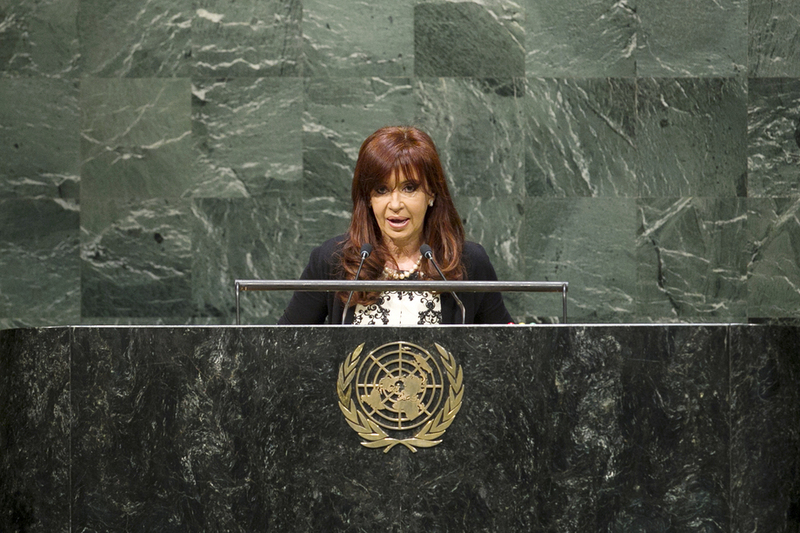 CRISTINA FERNÁNDEZ, President of Argentina, said most of the problems facing the world today resulted from a lack of democratic multilateralism. In that context, she welcomed the vote by the Assembly on resolution 68/304, to restructure the foreign debts of all countries. That had long been before the Assembly, which had called for reform of the international financial system and the Security Council. Argentina had previously experienced the kind of economic and financial crisis that had spread throughout the world in 2008, when, in 2001, it had been forced to default on its sovereign debt. Contributing to that collapse were the creditors’ terms that had been forced upon the country. As a result, there had not only been economic collapse, but a social and political implosion as well. Argentina owed 162 per cent of its GDP. Its creditors, having contributed to that, were obligated to shoulder some of the burden. The country had been able to formulate agreements with 92.4 per cent of its creditors, enabling it to improve the condition of its people, she said. Today the IMF recognized that the economic growth rate achieved by Argentina between 2004 and 2011 was the third largest in the world. In fact, Argentina now had the best growth in Latin America, which had been possible because $193 billion in debt had been restructured. Today, it carried one of the lowest debt loads in the world. However, she added, there were “vulture funds” of individuals who would not participate in the restructuring, but instead turned to the countries indebted to them and chose to go through the court systems. Some reaped more than 1,600 per cent profit over a five-year period. Those “vulture funds” amounted to economic terrorism, creating poverty, misery and hunger through the sin of speculation. For that reason, she called for a convention on multilateralism. Highlighting the attack on the Israeli Embassy, she said that Argentina had also experienced political terrorism. The country had sought to bring the perpetrators to justice, including through a memorandum negotiated with Iran, enabling the accused Iranian citizens to make statements in Argentina’s courts. Dialogue was essential, and in that context, she recognized the need for a two-State solution in the Middle East. She called on the Assembly to recognize Palestine as a State and full Member of the Assembly, noting that Israel must also be secure within its borders. “In a time of economic vultures and hawks of war, we need more doves of peace,” she said. Turning to the Security Council, she said that as long as the votes of the five permanent members counted more than those of other countries, nothing would ever be resolved. There would be a real beginning to a solution when the Assembly, where each member had one vote, became the sovereign body of the Organization. As a non-permanent member of the Council, she had questions about who had armed the “bad guys”, some of whom were now starting to cooperate. But one group had led to another, and now there was ISIS. “Where does this come from?” she asked. Some might be able to answer such questions, she said. In closing, she expressed thanks to all who had supported resolution 68/304 in the face of pressure not to do so.